Are sabers sharp or dangerous? No, all fencing weapons, epee, foil and saber, are especially designed for sport. They are made out of thin, flexible blades approximately ¼ inch thick and have blunt tips. Is fencing a safe sport? Yes, although the purpose of the sport is “to slash or thrust” the opponent, fencing is a very safe sport. Studies of injuries occurring during the Olympic Games have shown that fencing is a sport with one of the lowest injury rates. The protective gear and sport weapons are especially designed to protect the athlete from any harm. Are try out classes available? Yes, try out classes are offered to new comers who never fenced before. From the very first class students will get the opportunity to hold a saber and fence a bout. Find out which class fits your schedule best on our Programs page and contact us for an appointment. Comfortable athletic attire and non-marking tennis shoes. Yes, rental protective gear is provided during try-out and the Intro classes. It includes: mask, jacket and glove. Brand new equipment can be purchased in the boutique on the premises. 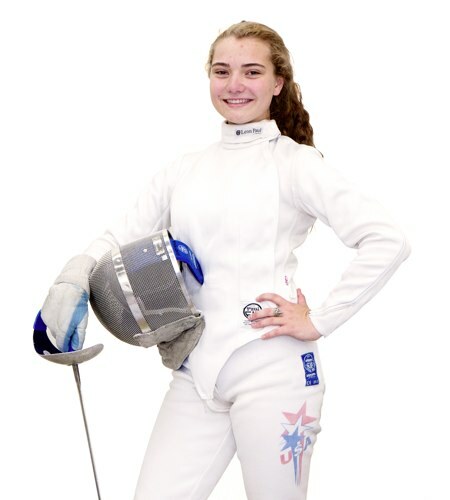 Child psychology research shows children to be developmentally ready for the sport of fencing around middle childhood. Children, teens, adults and late bloomers can start anytime and enjoy fencing as a lifelong experience. What developmental skills are needed? Fencing is a sport that requires hand-eye coordination, complex motor skills, quick decision making and detailed strategies. Children should meet both physical and emotional readiness criteria before getting involved in the sport. Children should start only when developmentaly ready, so their involvement will draw a positive experience. What is a fencing strip? The area fencers use for bouting is called a fencing strip or piste. Fencers advance or retreat on this long (14 m) and narrow (2 m) space that resembles combat in refined quarters like a castle hallway. The marks on the piste show the center of the field, the “en garde” or start up line and the end of the fencing strip. A match between two fencers is called a fencing bout. The fencer who first scores 15 touches on the opponent wins the bout. In team events the winning team has to score 45 touches. What does touché stand for? Touché is the French word for “touched” and is an honorary acknowledgment used by the fencer who just got hit by the opponent. Practice with other fencers outside a class setting, anytime during operating hours, but not during instructed group sessions. Full protective gear and at least one year fencing experience is required for athletes to bout unsupervised. Is fencing an Olympic sport? Yes, since the restart of the modern Olympic Games in 1896, fencing has been represented at each edition. Pierre de Frédy, Baron de Coubertin, founder of the modern Olympic Games, was a fencer himself. Is fencing a NCAA sport? Yes, fencing is a sport that is part of the National College Athletic Association and more than 40 universities have division I, II or III teams that compete for the NCAA Championships title each year. College coaches recruit young athletes who sometimes receive athletic scholarships for their sport achievements. Is fencing an Ivy League sport? Yes, fencing is a sport in the Northeastern United States collegiate athletic conference known as the Ivy League. The seven institutions part of this group that have fencing teams are: Brown University, Columbia University., Cornell University, Harvard University, the University of Pennsylvania, Princeton University and Yale University..